It has never been easier to launch in new markets. The internet has no borders; your reach could be anywhere. If you are an online business, your customers are not bound by borders. With solutions like Stripe, you can accept payments online from almost anywhere in the world. Etsy.com is a great example of an online business that has embraced being global, they epitomize the “being global, while appearing local” approach, as a result, one third of their sales come from international markets. This is also the age of hyper-personalization. You can reach almost anyone. However, to gain their attention, you need to reach them with engaging, relevant content. Within that simple statement lies two challenges. How do you reach your target audience? What is engaging, relevant content? At the core of both these challenges is language. 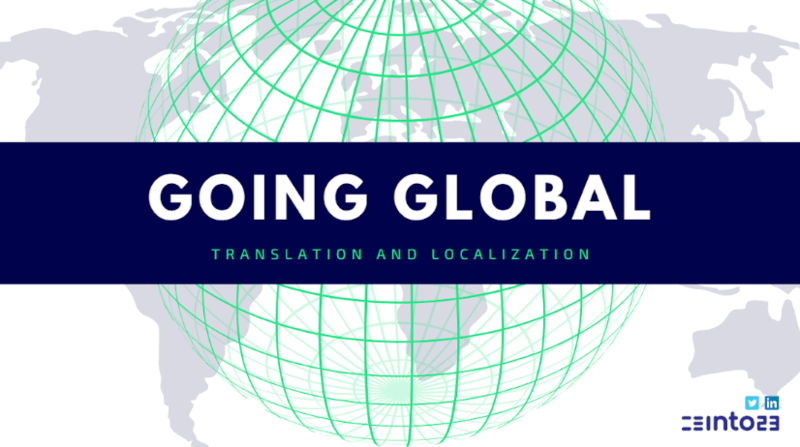 If you want to extend your addressable market by having a global reach, you need to think about translation and localization. Everyone knows what translation is. Translation is taking content from one language and putting it into another language. That process is the core of the translation and localization industry. You will read many definitions online about the difference between translation and localization. Most will say that the difference is between a direct translation and adapting the translation, so it is targeted for a particular market. But wouldn’t you expect that to happen in translation anyway? Putting multi-language subtitles on your marketing videos. Producing a translated PDF with layout and graphics in the target language. A website will all its content translated, graphics in the right language, SEO for the target language. Using MT to translate your FAQ with native editors improving the translation quality. Companies have been going global for a long time. Coca Cola signed its first international bottling agreement with San Miguel in the Philippines in 1927. Sony Corporation of America opened in 1960. McDonalds opened in Tokyo, Amsterdam, Munich and Sydney in 1971. Translation happened locally, on paper, sometimes inhouse or often with local translation agencies. The advent of the PC is what gave birth to the modern localization industry. This was when the concept of localization came about. It was also when internationalization came about, but we will get to this later. Creating a translated software version, for example, a Japanese or a French Microsoft Office, required a lot of work before the translation could even begin. Then once the translation was finished, you had more steps to have a final Japanese or French product. This entire process is localization. In the early days, this meant extracting strings from the code, translating them and then rebuilding the software. Creating a translated help system for the product meant building a ‘compiled’ help system after translating and checking that each and every link worked ok! Companies quickly realized that they could not manage all this in-house. Software launches were big events; new releases were yearly cycles. To service this new demand, localization companies started to emerge. They clustered around the big software companies that were outsourcing this work, mostly in Dublin and San Francisco initially. The localization companies built in-house project management teams to manage customer interactions but also worked with translation agencies around the world to deliver the translation. The localization companies built in-house software engineering teams to rebuild the localized software, and desktop publishing teams to recreate the localized manuals. The in-country agencies that used to do the translation work for the local subsidiaries of international companies started to work with the new localization companies. Some of them later being acquired to become a translation office for the localization company. The structure of the localization today has not changed much from this formation that emerged in those early days. What has changed is that a lot of the manual tasks have been automated by technology. Key Point: Translation has been around for centuries. Localization is the full range of activities needed to have a product or service market-ready in another language. Translation is part of the localization process. In recent years, technology has automated much of the localization process. Moving any translatable content to separate ‘resource’ files. Using system functions to display date formats, currencies, number formats, etc. UX/UI design plans for the different handling of personal names and addresses around the world. UX/UII design that allows for text expansion in other languages. Using Unicode to allow display of languages like Chinese, Arabic and Japanese. Key Point: Internationalization should be a core element in product design and development strategy. Translation technology automates many of the technical activities in localization. Technology brings cost savings, faster time to market and greater control over quality and consistency. We highlight some of the key technologies used below. We will delve into the importance of these in future posts. A translation memory is a database of content already translated, divided into segments. Its value is that you only need to translate a piece of content once. All subsequent occurrences will come from the TM. It emerged as a commercial product in the early 80s when Trados was launched in Germany. It was widely adopted in the industry when Microsoft took Trados as its standard in 1997, also acquiring a 20% stake in Trados. Translation Memory is ubiquitous in the localization industry today. TMX (Translation Memory eXchange) is an industry standard that allows the exchange of translation memories between different platforms. The major platforms today are SDL Studio, MemoQ, Memsource, XTM, Wordbee, Smartcat, Smartling, Lilt, Transifex, PhraseApp. Most technical, legal, catalogs, labels and e-commerce content have repetitive content. Translation Memory can greatly reduce the cost of translating this content as you will only need to translate repetitive content the first time. According to GALA, translation memory can reduce costs by 15-90%. Automation first entered the localization industry in the early 2000s. By the early 2000s, business process automation was the hot business topic and the localization industry was no exception. Translation Management Systems (TMS) automate the localization process. They integrate Computer Aided Translation tools, Translation Memory. Most also give access to Machine Translation engines. Machine Translation has been around a long time now. The first machine translation was a rules-based machine translation. This was superseded by statistical machine translation, most famously, by Google when they launched Google Translate in 2006. Machine Translation has been used in the translation industry for the last two decades mostly for European languages. Statistical machine translation did not have great results with Asian languages. Neural machine translation (NMT) replaces statistical machine translation. NMT is a deep-learning system that reduces translation errors by up to 60%, according to Slator. Post Editing is a 2-step process. Content is first translated using machine translation. It is then fully edited by a translator to bring the translation quality to human level. Neural machine translation with post-editing is perfect for any non-marketing content. According to Gartner, brands risk losing 38% of their customers because of poor marketing personalization efforts. Personalization does not end with marketing messaging; all customer interactions need to be personalized from pre-sale to post-sale. Talking to your customers in their native language is a fundamental part of engaging with your customers. Customer engagement today occurs across multiple different channels, when you add language to this, it increases the complexity. A good localization partner will help you manage this complexity. A good localization partner will optimize available translation technology to help you reach you target customer where ever they are in the world. Contact Into23 to learn more about how we can help.